Agent for preventing drop formulation - concentrate. Liquid, alkaline, foaming cleaning agent, which also speeds up drying. Excellent performance when removing all kinds of dirt from alkali-resistant surfaces such as autos. Specifically formulated for use in self-service car washes and high-pressure spray-cleaners. Vehicle cleaning applications: where an powerful but gentle cleaning agent is required. And Sapphire is especially useful where tap water is used, because it is formulated with wetting agents which help prevent the formation of drops which cause spots on clean vehicles. Self-Service car wash operations: where good results are required but the operators aren’t trained in auto cleaning. Economical to use because it is specifically formulated for cleaning the soiling on vehicles, and for use in pressure washing equipment. Highly effective with minimal concentrations because of the foaming action, which keeps Sapphire in contact with the soil longer. Friendly to users and the environment due to a high degree of biodegradability. 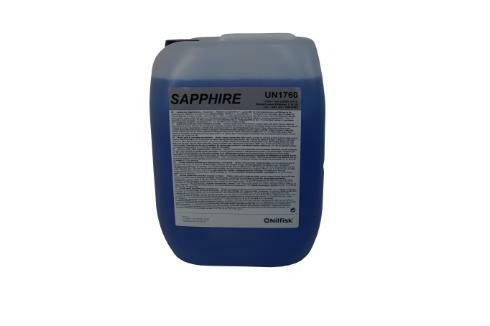 Optimum end results when tap water is used because the wetting agents in Sapphire help prevent the formation of spots on the vehicle surface. High Pressure Washers: Dilute 1:10 (10%) into the machine detergent tank, and set the detergent dosing valve between 1% and 5% as required. Optimum results are achieved between 0,1 and 0,5% in the cleaning spray. Self-Service Car Wash: Method will depend upon the type of equipment used, but the best results will be achieved with a concentration of between 0,1 and 0,5%. Always rinse well, and if tap water is used, the small amount of water remaining on the vehicle can be removed with a quick wipe of a chamois cloth. After drying, the surface will have a deep glossy finish. Do not use on hot painted surfaces, or allow the detergent to dry on the surface.